Down in the sewers, Donatello is busy repairing one of his proximity sensors when a female ninja swoops by, snipping off his bandana tails and escapes. Donatello recalls Raph having a similar encounter and decides to head home to tell Leo. Elsewhere in the sewer, Mikey is skateboarding and listening to music and completely fails to notice the female ninja snip his bandana tails. Mikey returns home and his brothers clue him in. Raph teases Leo that he’s sure to be next. 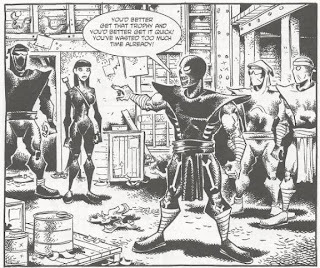 At a warehouse, the female ninja returns to the ones who sent her on her errand to collect the bandanas… the four rogue Foot Soldiers (Croaker, Wen, Gei and Szefchek). Croaker is furious that the female ninja has yet to collect Leonardo’s bandana and strikes her across the face. The female ninja promises to collect the trophy, as she’ll do anything to be a member of the Foot Clan. Back in the sewer lair, Don and Leo discuss the situation regarding the female ninja. Don considers setting an ambush for her on one of their patrol routes, but Leo doubts that she’d fall for such a ruse. He decides to go up to a rooftop and meditate on the subject. While meditating on a roof, Leo is spotted by the female ninja. She strikes and Leo allows her to snip his bandana, though he quickly subdues her. Forcing her to talk, Leo learns that her name is Hamato Hana and she is undergoing a Foot Clan initiation. Leo allows her to leave with his bandana. At the warehouse, Croaker and his cohorts are pleased with Hana’s success. Down in the sewer lair, Leo returns, saying he followed Hana to a warehouse by the docks. Splinter tells Leo that he has done well, then goes to his room to meditate. The Turtles then leave to scope out the Foot activity at the warehouse. Inside the warehouse, the Foot Soldiers and Hana display the bandanas and greet their “sensei”. The sensei steps out of the shadows, revealing himself to be… Splinter? Splinter tells Croaker that they have done well and that he will fulfill his end of the bargain by passing on Hamato Yoshi’s secret martial arts techniques… but only to his daughter, Hamato Hana. On a rooftop nearby, the Turtles are monitoring the conversation with some high tech surveillance gear of Donatello’s and aren’t too happy with what they’ve heard. Back in the warehouse, after Splinter has left and Croaker dismisses Hana, the Foot Soldiers begin gloating amongst themselves. Croaker laughs that the old rat bought their story about Hana being Yoshi’s daughter and that through her they will learn Yoshi’s secret techniques. Then, once they've learned them, they will become more powerful than even the Foot Clan. Listening in, Hana is shamed that she allowed herself to be fooled by the phony Foot Soldiers and realizes that all she’s strived for has been for naught. Down in the lair, the Turtles have a million questions for Splinter. Splinter tells them that some months ago, he was approached via the astral plane by a mystic claiming to know of Hamato Yoshi’s long-lost daughter, sent to Japan shortly after she was born. The man wanted to learn Yoshi’s secret techniques, supposedly for Hana’s benefit, but Splinter suspected a ruse. He then orchestrated the bandana-hunt to test Hana’s mettle and see if she alone was worthy of learning Yoshi’s techniques (and to see if her lineage was true). Raph demands to know why Splinter never told them about any of this as it went on over the past 6 months. Splinter tells him bluntly that the bandana-hunt was also meant as a test for the four Turtles… one that they failed. The next night, at the warehouse, Splinter is met by Hana (who is carrying a burlap sack). Hana tells Splinter that she cannot accept his offer to learn Yoshi’s secrets, as she admits that she has been lying to him. She is not Yoshi’s daughter, but his niece. After Yoshi was exiled from the Foot Clan, all members of his bloodline were shunned and barred from entrance. Wanting to restore the Hamato name within the organization, Hana came to New York to seek entrance through their branch. Splinter says that he senses a light within her and, regardless of the circumstances, would still like to train her in her uncle’s techniques. Hana again refuses, saying that Splinter was wrong about seeing any “light” within her. She then empties the burlap sack of its contents: the severed heads of the four wannabe Foot Soldiers. Splinter asks what Hana will do next, and as she disappears, she says that all she plans to do is survive. Returning to the lair, Raph jokingly asks Splinter how “Foot Class” went. Leo tells Raph to be quiet, but Splinter in turn tells Leo to hold his tongue. Splinter tells his sons that the student often has wisdom and it is the responsibility of the master to seek knowledge from all sources. As he retires to his room, he says that that lesson was one of Yoshi’s core principles. *The female ninja stole Raph’s bandana tails in Tales of the TMNT (Vol. 2) #8. *The Foot Soldiers (Croaker, Wen, Gei and Szefchek) last appeared in TMNT (Vol. 1) #45. *The Foot seem to have taken rather lax measures with the Hamato family after Yoshi’s disgrace. In Tales of the TMNT (Vol. 2) #65, it was said that the standard protocol of the Japanese branch was to kill the entire family of a disgraced member. *This issue also contained a bonus pin-up by Cheston Gasik. 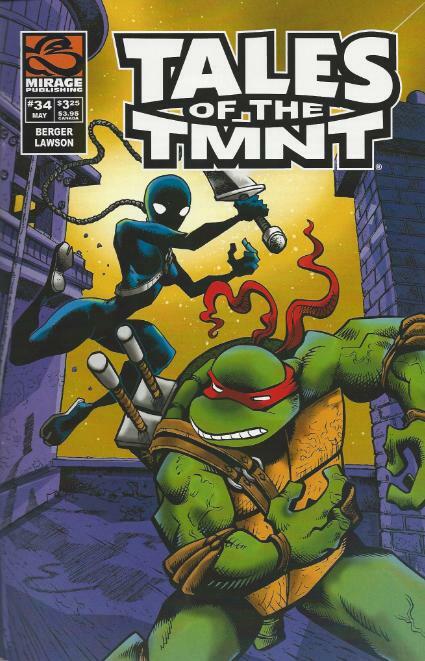 “Splinter Cell” is one of the more interesting issues of Tales of the TMNT (Vol. 2) in that it ties up loose ends from quite a few disparate issues, essentially weaving different plot threads together which I doubt were originally intended to interconnect. At long last, we have an explanation as to why Dan Berger’s Foot Soldiers from TMNT #45 were running around in those goofy Halloween costumes. Despite their claims, it turns out that they were never anything more than Foot Soldier wannabes. It makes a lot of sense, as the stupid outfits are the kind of things I can imagine a bunch of posers wearing; this is how they THOUGHT the Foot Soldiers dressed. It also makes their various schemes to find a master that will teach them a quick and easy path to ultimate power less random. Before, they tried to trick Leatherhead into being their master, and here they try to do the same thing to Splinter. These guys are such a pathetic joke, but funny in that manner. I kind of wish they hadn’t bought it at the end of this story (though I doubt, even if they’d survived, that we’d have ever heard from them again; we certainly never hear from Hana after this). My only grievance, and the only thing about this story that stuck out to be as not really working, was Splinter’s claim that Croaker contacted him via the astral plane. 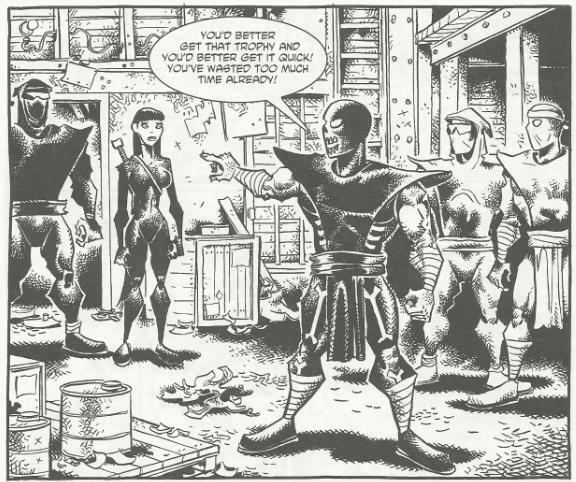 These Foot Soldiers had been established as rather unskilled wannabes, not good enough for the Foot Clan and always trying to find a master to teach them the “easy way”. The idea that Croaker could have mastered an advanced skill like astral projection (one it took Splinter years to figure out) just doesn’t gel with what we know about these guys. I think I’ll pretend that Croaker contacted Splinter not through the astral plane, but by dangling from a rope as his buddies operated a fog machine just out of sight. I’ve always liked the stories that go back and investigate the lineage and relationships of Yoshi, Saki and Shen. So even though she’s only his niece, Hana’s identity came as a satisfying revelation (much like the Mistress being revealed to be Tang Amaya). Her personality in this story seems a little different than in Tales #8, where she was an immature, talkative brat. Here, she’s played as being very serious and, outside of calling Leo a “creep”, does nothing to antagonize the Turtles (whereas in her first appearance, she was all about the verbal barbs). Like a lot of characters and plot threads introduced in Tales of the TMNT (Vol. 2), Hana is never seen nor heard from again. Nor referenced. She pretty much ceases to exist. One would think the niece of Hamato Yoshi would be more important than that, but I guess not. I would have liked to have seen more of her, certainly, as I think she had a lot of untapped potential as a returning character. All this issue does is remind me why I’m enjoying IDW’s TMNT relaunch so much. In that book, the history of Yoshi and his family are explored in detail and those details are never forgotten or derailed. The episodic nature of Tales of the TMNT was one of its strong suits, but the lack of dedication to plot threads was one of its most infuriating. It enjoyed introducing “important new characters” all the time, but never had the ambition or interest to ever do anything with them beyond the introduction. “But I guess with Karai, Tang Amaya, April and Shadow all running around, Hana would have been one kunoichi too many"
Mark, you are right on about so many Tales Volume 2 characters being underexplored. I think further stories with Hana Yoshi would've been great. She's like the most out of control version of Casey multiplied by 10. She flat-out kills people she has a moral disagreement with. I see her as kind of a Faith to the Turtles' Buffy, mixed in with a little bit of Lizzie from The Walking Dead. You really seem to like this story due to continuity, concluding plot lines and stuff. That's fair, but looking at it as a standalone story, I find it lacking. Niece isn't much of a 'miss personality', I don't feel like we learned anything, little action, Don and Mike come out as somewhat incompetent (comperable to Raph last time).